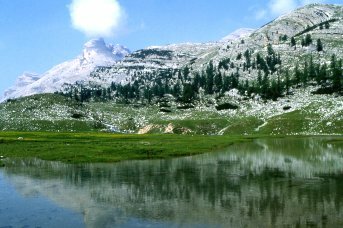 The alpe di Fanes piccola (Little Fanes Alp) consists of an imposing, raised-edged basin, that drops outwards (Badia valley) with perpendicular walls (Sass Ciaval m 2906, Sass dles Diisc m 3026, Sass dles Nü m 2968). Wild, barren, lunar, it shows peculiar karstification features. 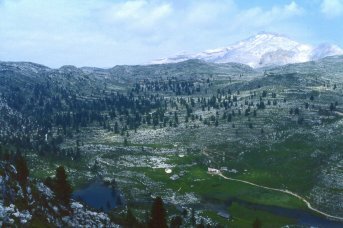 The smaller alpe di Fanes grande (Big Fanes Alp) consists on the contray of an idylliac flat valley with pastures. The basin of the alpe di Fanes piccola is composed by the usual rocks of Main Dolomite, but topped by more recent limestones layers (Jurassic) and also Cretaceous marls. Impressing packs of raised, bent, contorted strata can often be observed. The whole basin is intensely karstified; huge stretches of densely grooved karren stonefields can be met. Remarkable corrosion phenomena are present on the strata heads arranged like stairs. Water is almost absent, except for a few rainwater pools. 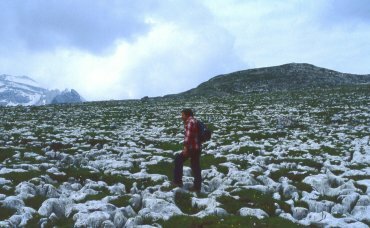 Strange to say, the alpi di Fanes are never directly mentioned in the legend as the site of specific occurrences , although it can be taken for granted that they were part of the Fanes' hunting and pasturing grounds. The names of the alps, Little and Big, are connected with the economical importance of modern pastures and of their relevant stables. Excursions: both Fanes alps are crossed by the itinerary proposed for the Cunturines round trip. 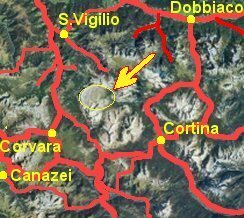 The alpe di Fanes piccola is also partially crossed by the itinerary proposed for the Sass dla Crusc. Another loop, across wonderful landscapes but only advisable to expert trackers, starts from the Lavarella hut m 2042, climbs the path to S.Antonio pass m 2466, then leaves any marked path to reach the slopes of the Ciastel de Fanes m 2657 and bends South to the Foppa lake, to reconnect with the path coming from the Medesc saddle, finally to come back on footpath to the Lavarella hut. The itinerary crosses very untrustworthy, dangerous terrain and the risk of losing one's orientation in case of fog is very high; allow for not less than four to five hours.